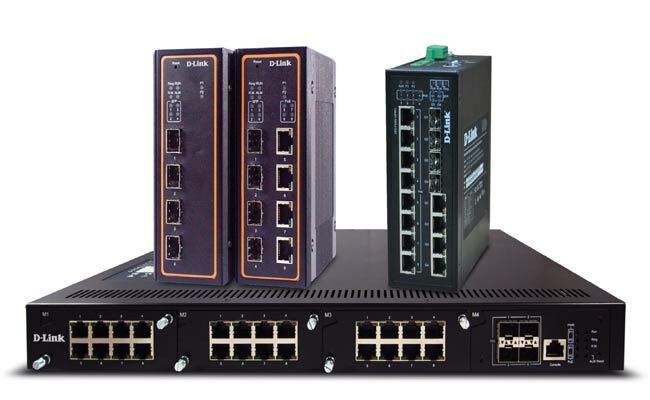 D-Link has introduced an extensive line-up of Industrial grade Ethernet switches. D-Link has a wide range of Industrial grade switches with features like Redundant Low Voltage DC power input, Overload current protection, IP-30 enclosure that shall provide users with best-fit solutions. D-Link’s industrial grade switches are available in four variants – DGS-F3400, DGS-F3600, DES-F3200, and DGS-F3000. These switches are designed to operate in extreme weather, resist shock/vibration, and surge ratings, thereby offering high redundancy and reliability. Overall D-Link Industrial switches can withstand harsh environmental conditions, are suited for controlled and challenging needs of Oil & Gas industry, Mines, Manufacturing Plants, Shipping etc. DGS-F3400 (Rack Mount) – The DGS-F3400 Series Layer 2 Modular Gigabit Industrial Managed Switches are equipped with 4 10G SFP+ or 1G SFP Ports & 3 open slots for 8 Gigabit port interface module. The fan-less design of DGS-F3400 Series extends the life of the switch and makes it capable to operate in wider temperature range of up to 75°C. DGS-F3400 series switches are PROFINET certified and Ethernet/ IP ready, which makes them a preferred choice for backbone of Industrial automation networks. DGS-F3400 series switches helps monitor performance and status as Modbus register and as an MQTT data point, allowing PLC or control unit to access diagnostic data in real time through Modbus TCP protocol. This unique feature of DGS-F3400 series switches help provide crucial information to Big-Data Analytics engine. DGS-F3600 series switches are PROFINET certified and Ethernet/ IP ready, which makes them a preferred choice for backbone of Industrial automation networks. The DGS-F3600 Series is equipped with advanced security features and layer 3 routing protocols. DES-F3200 (Rail Mount) – The DES-F3200 Series Layer 2 Fast Ethernet Industrial Managed Switches are equipped with 4/8/12/16 10/100 BASE-TX ports with or without PoE & up to 4 SFP ports. Equipped with fan-less design DES-F3200 series switches can operate in a wider temperature range of up to 70°C. DGS-F3000 (Rail Mount) –The DGS-F3000 Series Layer 2 Gigabit Industrial Managed Switches are equipped with 4 or 8 100/1000BASE-T ports with or without PoE & up to 4SFP ports. Equipped with fan-less design DGS-F3000 series switches can operate in a wider temperature range of up to 70°C. D-Link Industrial grade switches integrate advanced management and security functions to support a robust IT infrastructure solution. Further they are equipped with advanced security features such as static MAC, Storm Control, and IGMP Snooping. Being PoE ready, D-Link Industrial grade switches provide total PoE budget up to 240W, capable of supplying up to 30W of power per port to connected PoE enabled devices. This efficiently reduces deployment times, reduces cable clutter, and eliminates the need for dedicated power supplies to allow PoE devices to be installed in remote location. Availability – D-Link Industrial grade switch – DES-F3200 series, DGS-F3000 series, and DGS-F3400 series will be available pan India through D-Link extensive network of National Distributor, Business Distributors & System Integrators. All D-Link products are backed by its excellent service support infrastructure.